The Intel® XMM™ 7260 slim modem and Intel® XMM™ 7262 slim modem combine the Intel® X-GOLD™ 726 baseband, featuring an integrated power management unit, with the Intel® SMARTi™ 4.5 transceiver in a compact, power-efficient design. 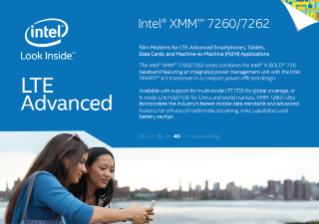 Available with support for multi-mode LTE FDD for global coverage, or 5-mode LTE FDD/TDD for China and world markets, Intel® XMM™ 7260 slim modem and Intel® XMM™ ...7262 slim modem incorporates the industry’s fastest mobile data standards and advanced features for enhanced multimedia streaming, voice capabilities, and battery savings. Follow a patient through discharge and emergency transport to see how real time data sharing and communications with secure mobile devices can make a "meaningful difference." Intel mobile communications offer seamless solutions across devices, networks, and standards.